The results of slow cooking lamb can be spectacular, as anyone that has enjoyed a braised lamb shoulder for Sunday lunch will attest. Cooking the meat in this way helps to develop deep flavours and produces tender, succulent meat. The most suitable cuts of meat from a lamb are those that have been ‘used’ by the lamb during its life, as these are tougher cuts and have lots of connective tissue. Browning the lamb prior to slow cooking caramelises the meat adding flavour to the final dish. Cuts of lamb used for slow cooking include shoulder of lamb, lamb shanks, diced leg of lamb, middle neck of lamb and lamb belly. Here we give a recipe for a lamb casserole, one of the most traditional ways to slow cook lamb. 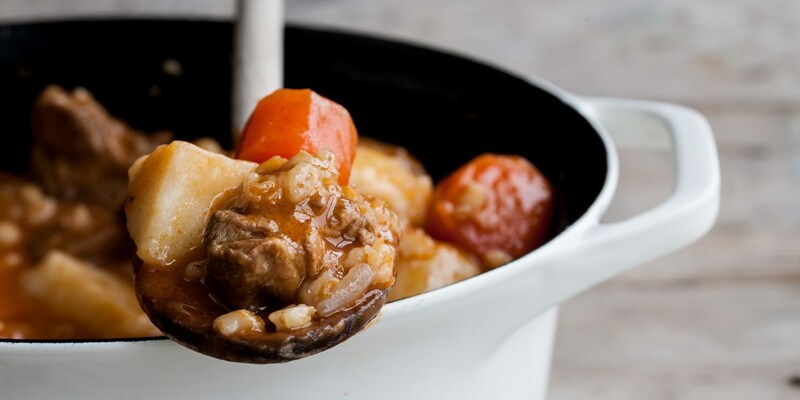 William Drabble uses lamb neck in his Lamb, potato and pearl barley stew whereas Phil Cornegie stews his lamb shoulder ‘Moroccan style’.